Many Gibson Guitars, Les Paul, SG, etc. There are other scale lengths on other (and even these) instruments but these are the more common ones you’ll find. As you can see, there’s quite a difference. So it’s a bigger/smaller thing? Yes. 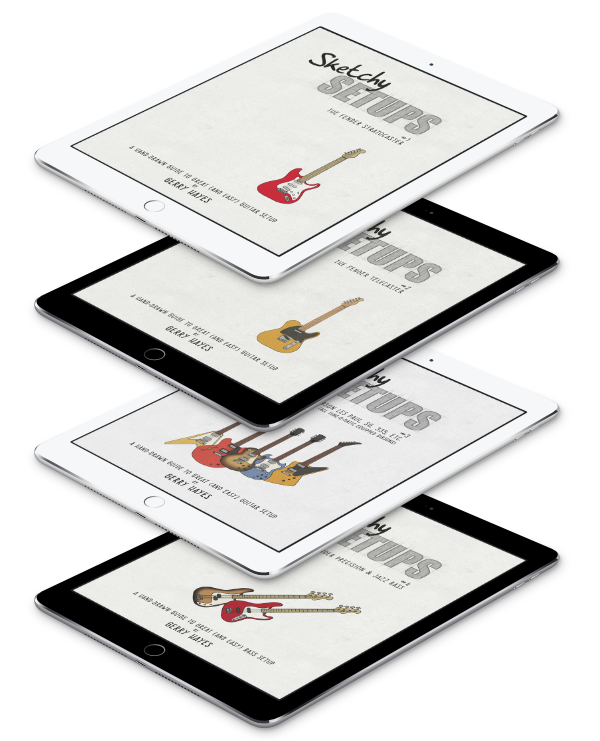 Firstly, and most obviously, scale length affects the fret-spacing – i.e. the distance between each fret – as you have to fit a similar number of frets into a bigger or smaller space. If you have small hands for example, you might appreciate playing a Fender Jaguar as the frets are not so far apart and so, you don’t have to reach so much between them. Nope. There’s a less obvious factor that needs to be considered too – string tension. Because the scale length determines the tension a particular string must have applied to reach a given pitch, different scale length necks will feel and sound very different. For example, the same gauge strings on that Fender Jaguar will feel different than if they were on a Strat. The Strat’s strings will have more tension and will ‘play’ differently. They’ll feel tighter for bending and fretting. They’ll also sound differently (if we take the variables like pickups, body wood, etc. out of the picture). The Strat will probably sound more ‘focussed’ and will probably sustain longer. So what scale length do I want? Up to you, I’m afraid. Each has pros and cons. Each feels and sounds different. It may come down to hand size and finding ‘the right size’ or it may be more of a playability and ‘feel’ thing – you may prefer a slightly slacker, bend-friendly tension for instance. My advice is to try a couple of instruments with different scale lengths. You might find you can get on with one better than another. Because of the combined wonders of music and mathematics, the 12th fret position on your guitar or bass is exactly half the scale length. So, if your guitar has a 25″ scale length, measuring from the nut to the centre of 12th fret (that’s the fret itself – the metal bar) should give you 12.5″. This is actually a handy way to check scale length if you don’t have a loooong ruler or measure. If measuring the full scale length (i.e. the full length – not just to the 12th fret as mentioned in the shortcut-tip above) we usually measure at the top-E string. That’s because this string is the thinnest and requires the least amount of string compensation. This string is, therefore, closer to the actual scale length of the instrument. The other strings are generally compensated which means they’re actually slightly longer than the scale length. When you fret a string somewhere along the fretboard, you actually sharpen that string’s pitch by a tiny amount. To compensate for this, each string is made a little bit longer than the instrument’s actual scale length, thereby ‘flattening’ its pitch. The amount that each string is made longer (flattened) depends on that strings size – thin strings not much and getting progressively more as the strings get thicker. Clever, eh? 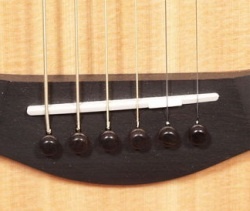 To nicely illustrate it, this is why acoustic saddles are angled – the sounding length of the thicker, wound strings is actually longer than that of the thinner strings. Many guitars have adjustable bridges and/or string saddles to allow each string’s compensation be accurately set. Setting the compensation is referred to as ‘intonating‘ the instrument and the compensation overall can be called ‘intonation‘. More about that another time – it’s a whole other kettle of piscine-like creatures. As always, if you’ve any questions, feel free to ask them in the comments.